I love classic things that are still being made in the authentic style. There are many examples of this, but none better than the classic tin cups of Jacob Bromwell. These old school cups are still being made the way they were 200 years ago. Some say that whiskey tastes best when sipped from a tin cup like our forefathers did – now that’s something that I’m willing to try. 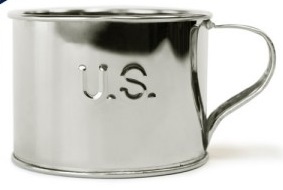 Learn more about Jacob Bromwell’s 100% American made products here.